Yellow bean sauce is used for particular Thai dishes, including khao man gai, pla jian, and gai pad kee mao. Also an be used in any recipe calling for soy bean. We offer premium quality Healthy Boy brand, naturally fermented in the most modern facility. Packed in a nice glass bottle. 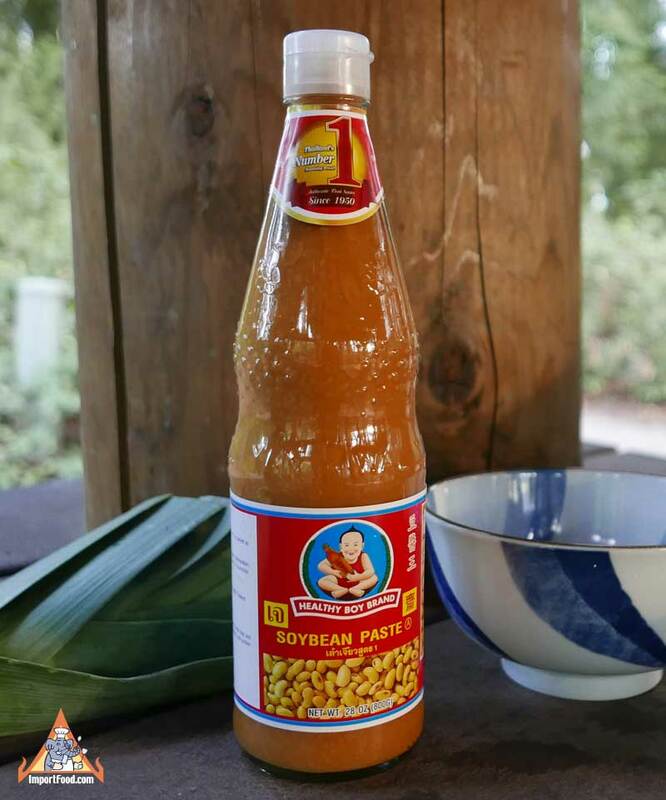 Please see our feature story on how yellow bean sauce is made. Ingredients: yellow bean (soy bean), wheat flour, salt water, sugar, msg, preservative. Mussels complement Thai flavors very well. In Washington State we can buy 5 lbs of fresh Penn Cove mussels for about $12, and we're always experimenting with them to create tasty Thai recipes. This one is adopted from a cookbook created by the family that owns Healthy Boy brand soy sauce. This is a regional recipe from Kanchanaburi province in Thailand. Similar to normal ginger chicken soup, this style is a bit sweet and salty as a result of the yellow bean sauce. It also has a mild heat from ginger and Thai pepper powder, which helps release gas from the stomach. In the past and also nowadays, Gai Joo Khing is the best dish to help a woman recover from giving birth and brings a lot of breast milk for the baby. Not only can you use chicken for this tasty dish, but fried fish can be used also. To make good Gai Joo Khing, you must fry the chicken with garlic and ginger until the aroma and flavor of ginger is prominent in the chicken before you add water. Lon (pronounced Loan) is a special word for dipping sauce that uses coconut milk. The flavor of this dish is somewhat unique, sweet and just a tiny hint of spice. Kids enjoy the dip and it's a healthy appetizer. The combination of the yellow bean sauce and sugar, along with the maengda flavoring, creates quite an aromatic explosion of flavors and smells. Very authentic recipe here, true to the Thai taste, follow the instructions and create a real "taste of home" for Thai people that they may have eaten or smelled in America.